Much like exercise, music has the power to clear the mind, elevate our mood, and make people move in ways they never thought possible. And, aside from proper nutrition, music can play a crucial role in helping athletes to perform at their best or gain a competitive edge. Over the years, studies have been conducted that show how music can fuel exercise and improve athletic performance. Dr. Costas Karageorghis, a sports psychologist at Brunel University in England, has studied how music can fuel exercise for nearly two decades now. In his book Applying Music in Exercise and Sport, Karageorghis’ research has shown how all aspects of music, from the tempo to the lyrics, can intensely affect a person’s exercise performance by changing their mindset or distracting them from discomfort. It’s no secret that many professional athletes and sports teams use music to help them get in the right frame of mind before a big game, race or event. Most notable among those athletes is probably Michael Phelps—the most decorated Olympian of all time. Cameras caught a glimpse of Phelps listening to music and getting his “game face” on in the warm-up area before his 200-meter butterfly semifinal with rival Chad le Clos, at the Rio 2016 Olympics. Phelps’ game face sparked the “Phelps Face” media hashtag, but Phelps wasn’t giving le Clos a death stare, he was simply getting pumped up for his race while listening to Future’s “Stick Talk.” It was his way of using music to get in the zone and prepare to execute his performance to the best of his ability. Phelps has since shared his pre-race playlist which consists mostly of rap and hip-hop music. It’s available to listen to on Spotify. This idea of using music to pump oneself up, or get in the zone before or even during a workout got me thinking. What types of music do Uncanny’s athletes find motivating during a workout? So, I set out to find what beats make Uncanny athletes want to run a little faster, row a little harder, jump a little higher, and add some more weight on the barbell. I took to the Uncanny Peeps Facebook group page to find out. The results were somewhat surprising. Uncanny music motivation genre poll. 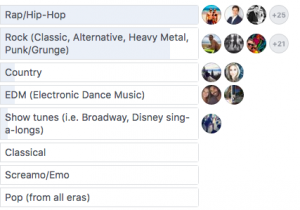 The top two favorites were rap/hip-hop and rock. However, I was surprised that rap/hip-hop edged out rock for the top spot. Our gym just earned a bit more street cred with that top pick. Once you can get past some of the explicit words that many rappers input into their lyrics, the tempo and bass of most rap/hip-hop songs can put some serious pep in your step. 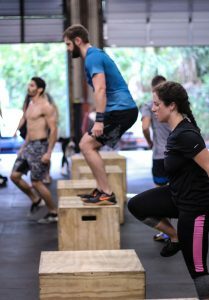 I may be biased, but there is something to be said for doing box jumps or burpees on cadence to the hook from DMX’s “X Gon’ Give It To Ya.” Don’t believe me? Try it. The pace of DMX’s lyrics and beat complement the sustained moderate/fast pacing needed to get through a chipper workout perfectly. Just make sure to keep breathing. To those who didn’t vote for rap/hip-hop, it’s okay. It is inevitable that not everyone in a class will like what is being blasted over the sound system every day. Music taste is obviously subjective. Just know that the time and place for listening to show tunes is during open gym. Uncanny athletes Raquel (foreground) and Rob (middle) box jump to the beat during a workout. 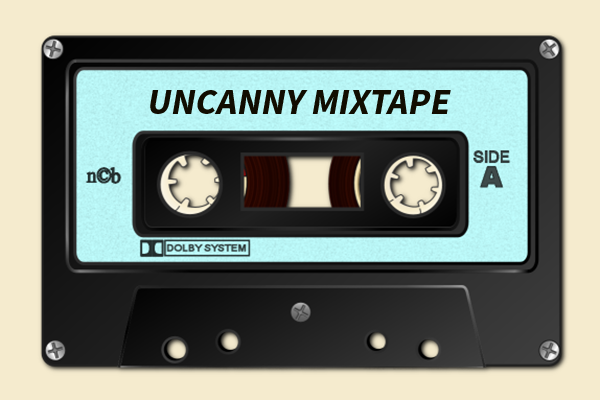 The Uncanny Mixtape will drop soon. Stay tuned! Until then, if you have a favorite song that helps you to push a bit harder during lifts, workouts, or even skill work, let a coach know so they can add it to our growing list!